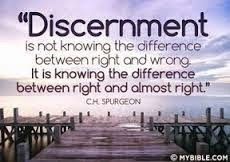 Putting discernment to a practical use presents some major problems, especially in today’s society where “do not judge” is the rallying cry for anyone who feels guilty about something. Discernment based on the black and white aspects of “you can” or “you can’t” is simple. Discernment based on the “I don’t agree with your teaching” is simple. Neither of those, however, is the true exercise of discernment, but rather the methods of the judgmentalist. In my experience, I have come to realize that many critical people actually have the gift of discernment, but they’ve never been taught how to use it properly. What shows up is simply a manifestation of the fallen nature, rather than a manifestation of the spiritual life. A critical person could well be trained in discernment if they could just let go of the criteria they use and the methods they employ. If so, ask the Lord if this is true. Ask Him how you should go about bringing grace and mercy to your gift, rather than condemnation. Spiritual discernment, that which is not based in the cut-and-dried world of black and white, takes time to develop and is usually attacked by others when exercised. We all know of the five senses of the body—touch, taste, smell, sight, and hearing. But what about the senses of the soul and of the spirit? The senses of the soul are will, knowledge, emotion, reasoning, and affection. The senses of the spirit are worship, love, faith, praise, fear. The 15 senses that are a part of our entire being are to be exercised, ie, trained, to discern between that which is good and that which is not so good. The word for exercise or train is the Greek word from which we get our word gymnasium. A gym is for training. Training is time consuming, not only with each visit to the gym, but the fact that it takes many trips to the gym before the training begins to have any effect. So, what does training the senses in discernment look like? The beginning stages are probably clumsy and painful. When you were little, your parents told you not to touch the stove, because it was hot. You probably didn't know what “hot” meant, or maybe you just didn't think you had to obey your parents. So, you touched the stove. You cried, got a lecture, got some loving, and went on your merry way. Now, however, you have your own personal experience with a hot stove. You probably haven’t learned to tell the difference between a hot stove and one that is not, but you don’t care. You’re not going to touch that thing ever again. But, you become older and wiser. Now you can simply put your hand near the stove and you can discern whether it is hot. Other things may not be as plain and simple in the experience of training. I worked around power tools for many years. Why should I? I could still hear. Now I can’t. Taking heed to the warnings about the effects of loud noise on one’s hearing could have prevented me from being in the condition I am now. The point is, training in discernment takes time, understanding, and wisdom. It’s not going to just show up overnight. The first place to begin is with the Scriptures. Learn what the Word says about not being deceived. And then put it into practice. Find out if God knew what He was talking about. Don’t laugh at that suggestion. Many Christians in my experience have failed to put what they hear into practice (James 1:22) They do not know from experience if the things stated clearly in the Bible actually work or not in the modern world. For instance, there are five verses in the Bible where we are specifically warned about particular deception. There are also the words “beguile”, “beware” and “deceive”, along with their derivatives, that should be considered. Remember, though, that deception is just that—deception. You may go through those verses, agree with the concept, and not even realize you may have already been duped. This requires getting serious with the Lord about your life. Then, when something is “discerned,” that recognition may require some sort of action.